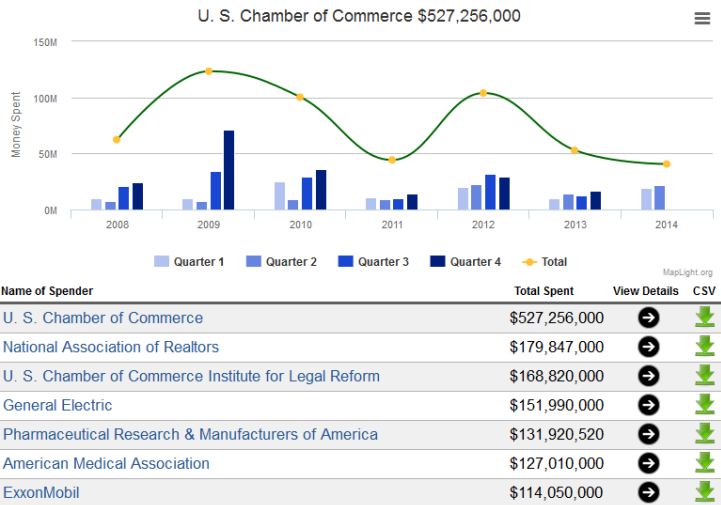 MapLight is pleased to announce the launch of its new federal lobbying database. MapLight's searchable dataset on federal lobbying is made freely available through both a Web interface and a CSV downloadable format, and provides timely information on unions, companies, and organizations that are lobbying the federal government. It includes information on how much money is being spent, which firms are being hired, which issues are being lobbied on, who is being lobbied, and more. Use case: If you were working on a piece on net neutrality you could combine CSV files from companies from a specific industry or set of industries—telecom (AT&T, Verizon, Sprint, T-Mobile) with cable (Comcast, Time Warner, DirectTV) to uncover trends in specific fields of the data, aggregate totals, and more. Editor's note: If you use MapLight data, please cite us. MapLight is happy to provide additional details to journalists regarding specific lobbying data (specific issues lobbied on, government entities lobbied, and lobbyist names) and to perform custom research inquiries on the data. Please do not hesitate to call us if we can be of assistance. Methodology: MapLight analysis of federal lobbying disclosure filings from the Clerk of the U.S. House of Representatives. Lobbying totals represent money paid by an organization to each lobbying firm for services on all issues. Organizations report total lobbying expenses as a lump sum, which includes both in-house lobbying expenses and amounts paid to (and reported by) lobbying firms that they employ. MapLight calculates a given organization's in-house lobbying expenses by subtracting the total income reported by the lobbying firms that it employs from the company's total reported expenses. In general, filers may round their spending and expenses to the nearest $10,000, and we treat the designation of "Less than $5,000" as a value of $0. MapLight updates its lobbying database daily to capture amendments. Full reports are due on the 20th day of January, April, July, and October.